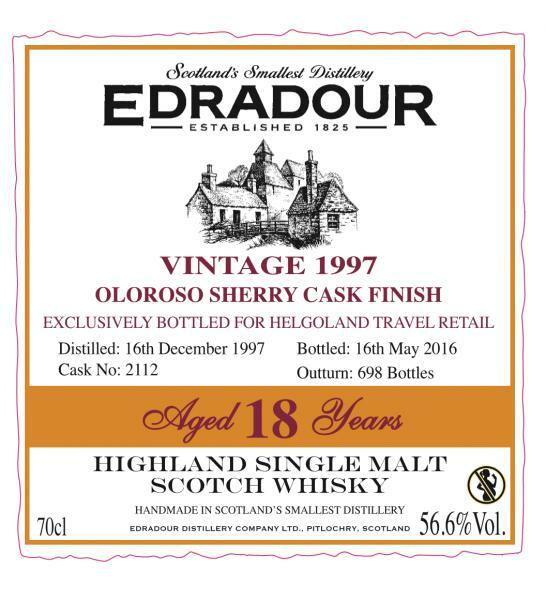 A good sherry mole with strictness and restraint characteristic for the distillery, maybe a little harsh and not very diverse in the range of derivatives. Dry, slightly restrained, processed wood, furniture varnish, light notes of raisins, dried fruits, new leather goods, light earthy shades, pu er. Powerful, sharp, sweet-woody, lacquer shades, powerful peppery wave, raisins, sour prunes, creamy confectionery notes. Spicy, warming, prunes, dried mushrooms, burnt caramel, rye crumbs, kvasnoe wort, porter, metallic sour, mushrooms. 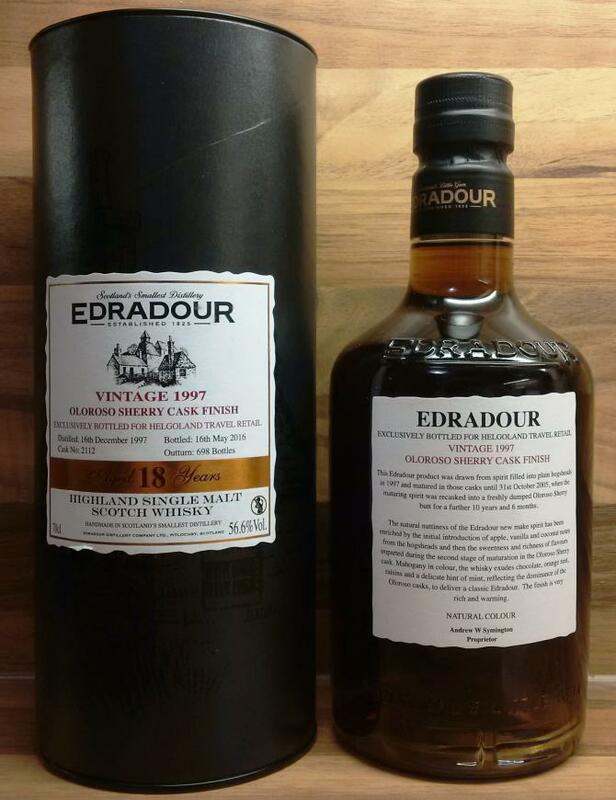 A great Edradour, no doubt. 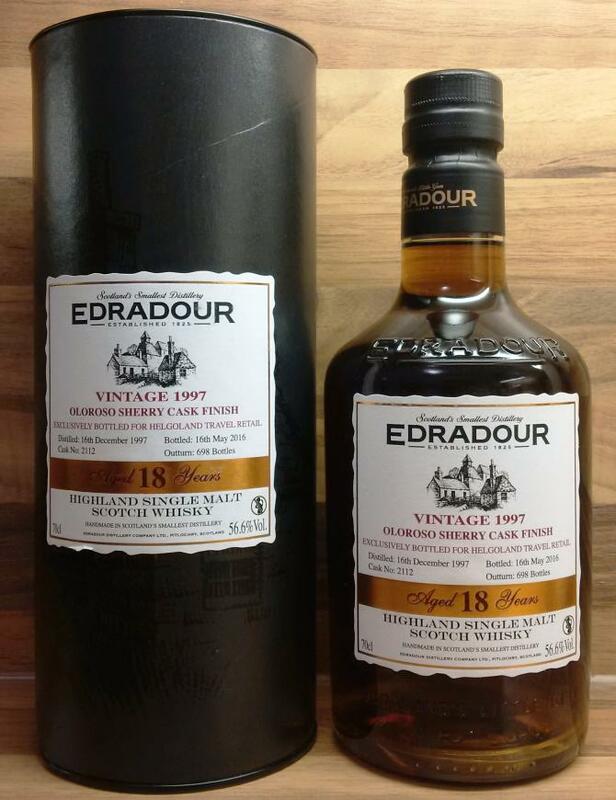 Whether the (in my opinion) high price for an 18-year Edradour is justified, I can not say, but this Edradour captivates with its spicy oak tones and the mixture of fruity and bitter fruit notes. 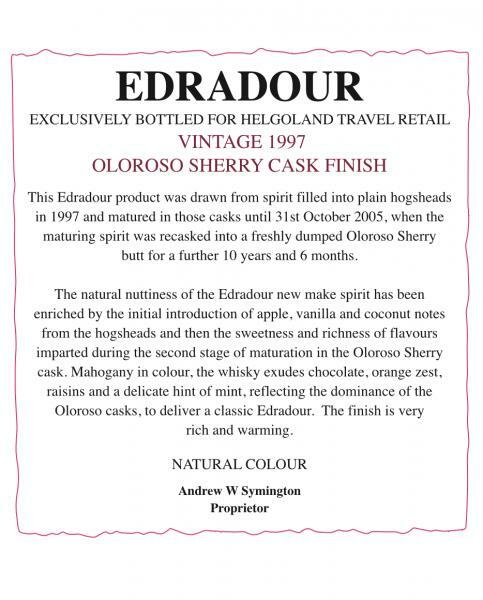 A complex and multi-layered malt. Great part! Immediately, dark berry aroma flows out of the glass, intense and voluminous sherry aroma dominates the first impression. A subtle orange and mandarin flavor is added, the 56.6% alcohol content is slowly becoming noticeable. Milk chocolate and a subtle sweetness harmonize perfectly with the fruity note. The orange flavors become more intense, some caramel comes from the extremely fruity nose. The salivation is massively stimulated, I look forward to the first sip! Short flash fruity notes before extremely spicy oak in the mouth explodes. Dark berries play with oranges and subtly bitter grapefruit, the wood is now tart and dry. Nut aromas penetrate through the spicy and fruity wood, Buttery creaminess mixes with the spicy wood, a load of pepper and salt suddenly explodes in the mouth. Dry and dry, the finish begins. Intense walnut aroma and wet leaves mix with the spicy wood, the fine heat exudes a wonderful mouthfeel for a very long time. The spicy wood, the sharpness and the intense nut aroma are long remembered.